Another post by my guest blogger from the HCBN network, Ak Brown. Going back a bit to my last post, it surfaced around how a lot of these girls believe that if they post some cute pics here and there that they're instantly a fashion blogger, and a lot of my readers think that if that doesn't make them a fashion blogger, then that makes them a personal style blogger, and that's also very much wrong. Even though fashion blogging and personal style blogging are in two different niches, they still serve a purpose of providing quality content that will engage the reader, spark interest, get a conversation going, and sometimes go out of the box when it comes to topics that are being discussed. Just because you are a personal style blogger doesn't mean that your reader base doesn't expect quality content from you. I don't care to just look at pretty pictures of the same type of outfits. We all know the typical Instagram blogger outfit, a signature Chanel chain bag, blazer, and pointed toe heels, sunglasses glued to the face and walking down the street as if she didn't have a goddamn care in the world. That is not blogging! 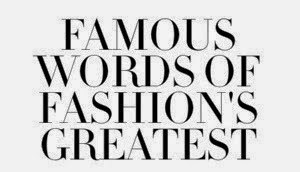 I would prefer much more style tips on how to dress for different occasions, celebrity looks for less, where to find staple pieces, makeover stories, etc. Just because your niche is to showcase unique ensembles, that doesn't mean quality content shouldn't follow behind it. More importantly, a lot of bloggers are both fashion and personal style bloggers, we are indeed. We like to not only give our opinions on controversial topics going on in the fashion industry but we also try and give some tips and outfit inspirations here and there. In my opinion, I think we are all fashion bloggers, and then there are the sub categories where personal style comes into play where some people love to focus heavily on that. Nothing wrong with that by any means, but once again, just don't think that putting up a few generic outfit pics make you a blogger. It's more work put into it.